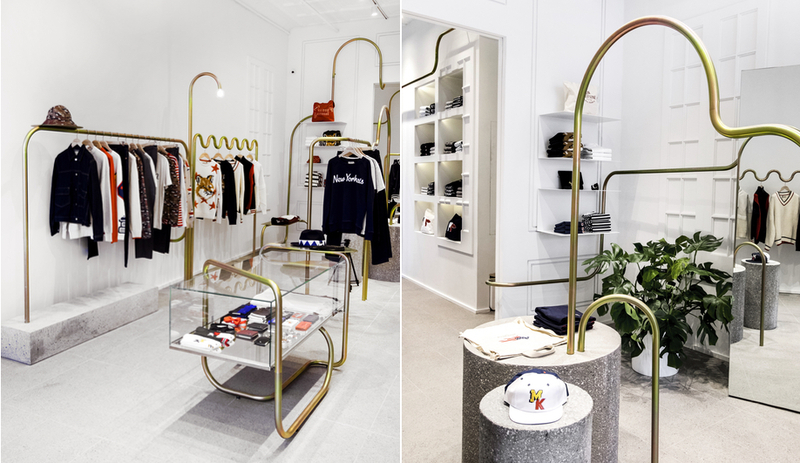 Maison Kitsuné prides itself on being eclectic. The Parisian brand is known for (in no particular order) influential mix tapes, buzzy parties, chic streetwear and global pop-ups. Capturing its essence is no small feat, but Mathieu Lehanneur is up to the task. In Japanese folklore, the fox (or kitsuné) is said to have shapeshifting qualities. 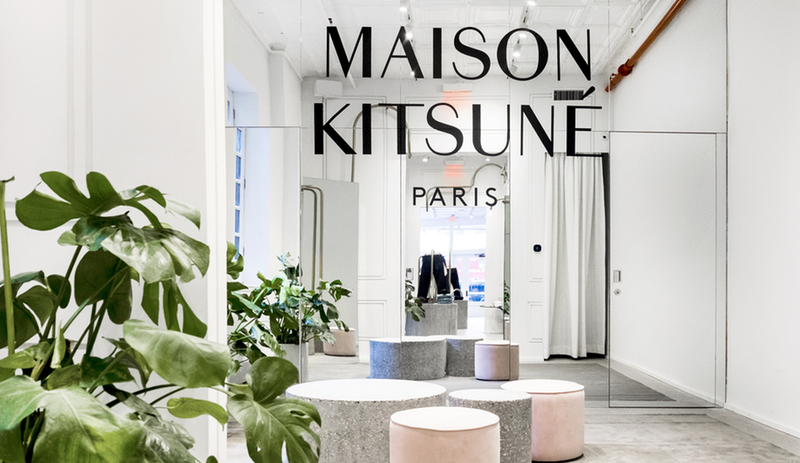 That’s a concept taken seriously by Maison Kitsuné, which, since its foundation in 2002, has been a record label, fashion brand, tastemaker and store. For its New York flagship, which recently relocated from Broadway to SoHo, the French brand enlisted a designer who could embody all of its qualities simultaneously – all the while adding a little esoteric magic. It turned to French designer Mathieu Lehanneur. 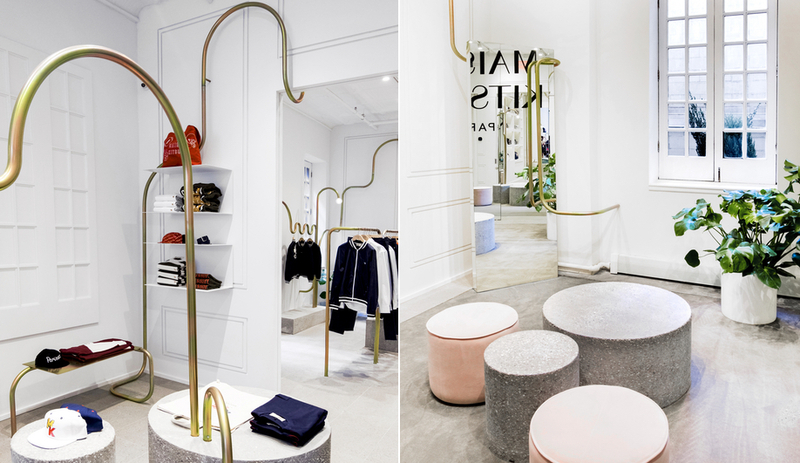 Lehanneur – who brought us the restaurant of the future and is currently the chief designer for tech giant Huawei – transformed the 130-square-metre area on the ground floor level of a brownstone into an environment that is part retail and part gallery. 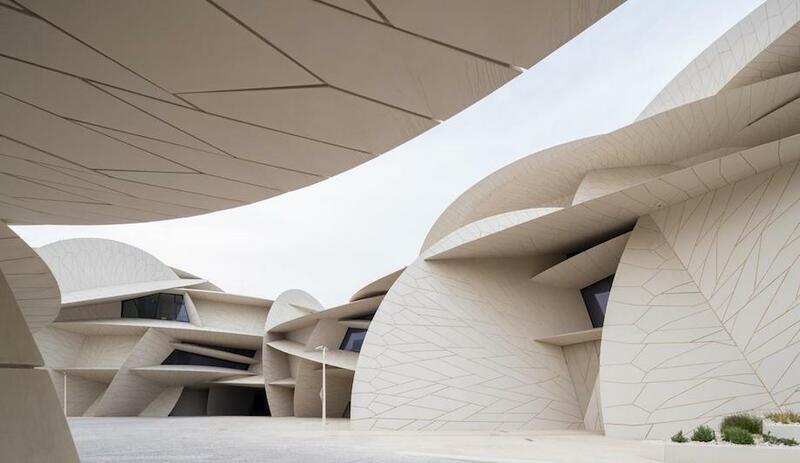 It’s defined by a bichromated steel rail – which “gives them a colourful, almost childlike appearance, like a magic candy on the scale of architecture” – that curves and swoops like a vine, seeming both organic and inorganic. 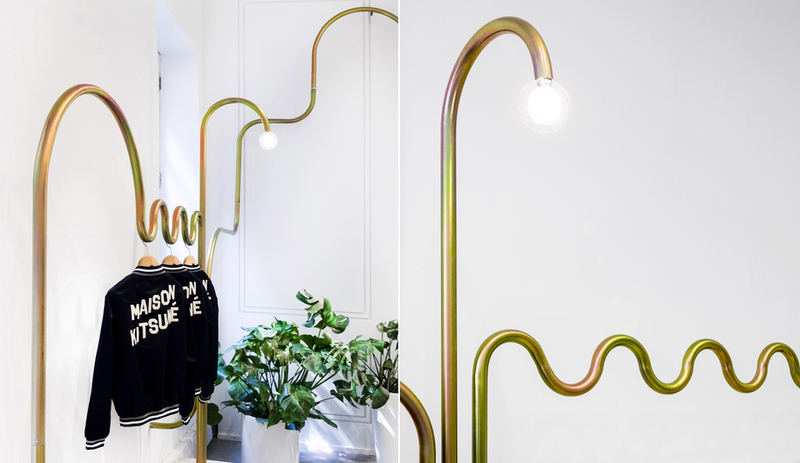 The rail indeed guides the eye to Maison Kitsuné’s mirror-clad changing rooms but, along the way, serves as a clothes rack and lighting fixture. It’s a design Lehanneur calls a “magic pencil, drawing its own line within the space.” We’re inclined to agree. Lahanneur’s subtle whimsy continues elsewhere. 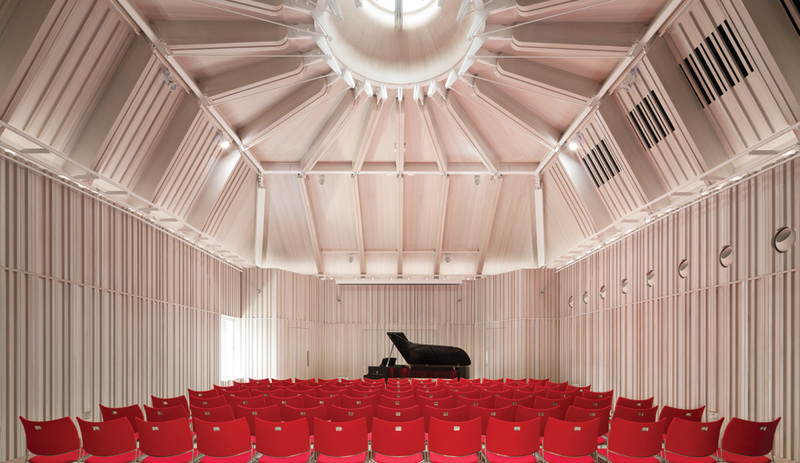 Ghostly window panes and wall mouldings emerge from white walls – a nod to the building’s residential roots while suggesting there’s something invisible beyond its walls. In this context, the rail looks like something else: it resembles an exposed pipe, or perhaps a bicycle rack, only one carrying premium bomber jackets. The design doesn’t overwhelm Maison Kitsuné’s stock. Clothing is still the focus here. 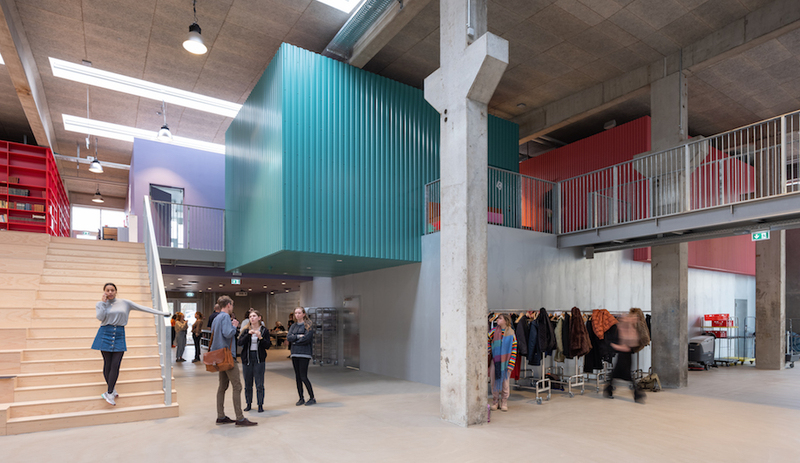 Caps are elevated on circular concrete pedestals, shirts lay neatly folded on minimal white shelves, accessories are presented in glass vitrines wrapped with – you guessed it – that ubiquitous metal rail. 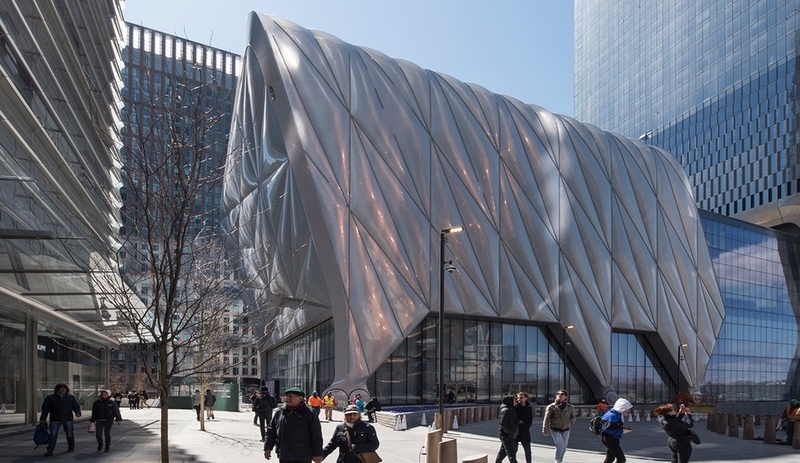 It’s a retail space that feels like an apartment, a luxurious store built for accessibility. Lehanneur is known for blending organic and mineral elements, as evidenced by his Liquid Marble installation at the Musée des Arts décoratifs in May. He also created an installation for the London Design Festival in 2016 (below, left). 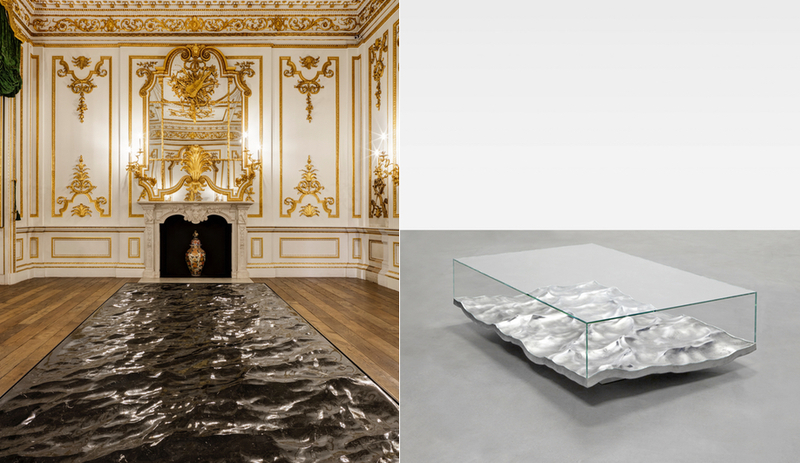 Here’s a closer look at Mathieu Lehanneur’s liquid marble work (left, as an installation at V&A London and right as a table). At Maison Kitsuné, Lehanneur blends marble, steel and concrete with splashes of green. 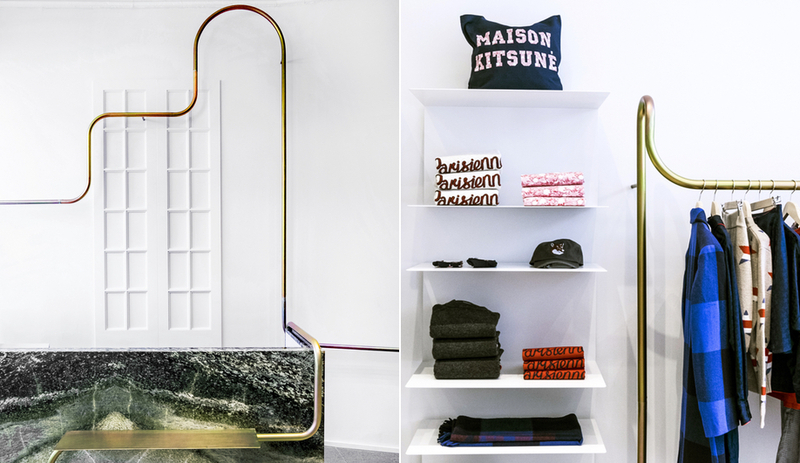 Indeed, Maison Kitsuné thrives on being a paradox, and so, too, does Lehanneur.